25 April 2017. Researchers in Texas designed a cancer vaccine with nanoscale particles that in lab mice stimulates the immune system and stops the growth of several types of tumors. The team from University of Texas Southwestern Medical Center in Dallas describes its discoveries in yesterday’s issue of the journal Nature Nanotechnology (paid subscription required). The UT-Southwestern team, led by professor of pharmacology and otolaryngology Jinming Gao, is seeking a more direct method for delivering agents activating the body’s built-in or innate immune system that includes T-cells, white blood cells fighting foreign invaders. Most current immunotherapy methods, say the authors, require proteins known as antigens to first link up with the immune system cells, which then travel to lymph nodes where they activate T-cells to fight tumors. The team’s method instead adds antigens with biocompatible polymer plastic nanoparticles that go directly to the lymph nodes to activate T-cells. 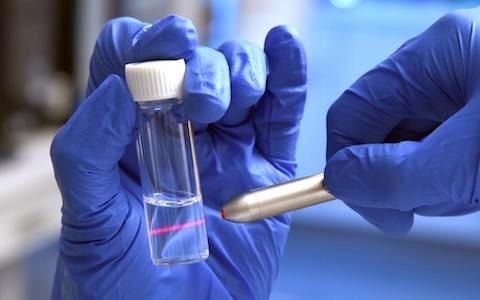 The researchers configured the nanoparticles, code-named PC7A NP, as a platform technology, which means the same basic design can be adapted for different types of cancers, and even other diseases. T-cells activated by PC7A NP stimulate genes coding interferons, a group of proteins that send signals to fight invading pathogens, like bacteria and viruses, but also tumor cells. The team tested PC7A NP formulations in lab mice induced with melanoma, an advanced form of skin cancer, colorectal cancer, and cancers resulting from the human papilloma virus affecting the cervix, head, neck, and genital regions. The results show the nanoparticles travel to mice lymph nodes, bind easily with target antigens, stimulate a strong T-cell response, and generate interferons. As a result, these reactions sharply limit tumor growth in the mice. The researchers also combined PC7A nanoparticles with antibodies designed to counter programmed cell death, or PD-1, proteins that prevent the immune system from fighting tumors and its supporting microenvironment. The results show PC7A nanoparticles work well with anti-PD1 antibodies, extending survival of the cancer-induced mice for more than 60 days. In addition, when injecting the mice later on with more cancer cells, the immunity built up from the nanoparticles appears to prevent further tumor growth. The PC7A nanoparticles also appear to limit adverse side effects sometimes experienced with cancer immunotherapies, which can result from their more complex design and use of bacterial agents to alert the immune system. The researchers found the nanoparticles generated low amounts of cytokines, small proteins generated by the immune system, some of which can cause inflammation and other adverse effects. The researchers are now looking into clinical trials of PC7A treatments with colleagues at UT-Southwestern on a number of cancer types, particularly in combination with checkpoint-inhibitor therapies that remove roadblocks for the immune system to fight cancer.